References m_pPackets, Packet::setParent(), and UT_return_if_fail. Referenced by ABI_Collab_Export::_handleNewPacket(), ABI_Collab_Export::change(), and ABI_Collab_Export::signal(). References _PCT_FirstChangeRecord, ChangeRecordSessionPacket::getAdjust(), m_pPackets, and UT_continue_if_fail. 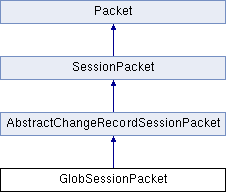 References ChangeRecordSessionPacket::getLength(), ChangeRecordSessionPacket::getPos(), m_pPackets, PCT_ChangeRecordSessionPacket, PCT_ChangeStrux_ChangeRecordSessionPacket, PCT_Data_ChangeRecordSessionPacket, PCT_DeleteStrux_ChangeRecordSessionPacket, PCT_Glob_ChangeRecordSessionPacket, PCT_GlobSessionPacket, PCT_InsertSpan_ChangeRecordSessionPacket, PCT_Object_ChangeRecordSessionPacket, PCT_Props_ChangeRecordSessionPacket, PCT_RDF_ChangeRecordSessionPacket, PCT_RevertAckSessionPacket, PCT_RevertSessionPacket, PCT_SignalSessionPacket, UT_ASSERT_HARMLESS, UT_continue_if_fail, UT_NOT_IMPLEMENTED, UT_return_val_if_fail, and UT_SHOULD_NOT_HAPPEN. Referenced by AbiCollab::_fillRemoteRev(), ABI_Collab_Import::_import(), and ABI_Collab_Export::change(). References _PCT_FirstChangeRecord, ChangeRecordSessionPacket::getPos(), m_pPackets, and UT_continue_if_fail. References _PCT_FirstChangeRecord, ChangeRecordSessionPacket::getRemoteRev(), m_pPackets, UT_continue_if_fail, and UT_return_val_if_fail. References _PCT_FirstChangeRecord, ChangeRecordSessionPacket::getRev(), m_pPackets, UT_continue_if_fail, and UT_return_val_if_fail. Referenced by ABI_Collab_Import::_import(), and toStr(). References getAdjust(), getLength(), getPos(), getRemoteRev(), getRev(), and m_pPackets. Referenced by addPacket(), getAdjust(), getLength(), getPackets(), getPos(), getRemoteRev(), getRev(), GlobSessionPacket(), toStr(), and ~GlobSessionPacket().